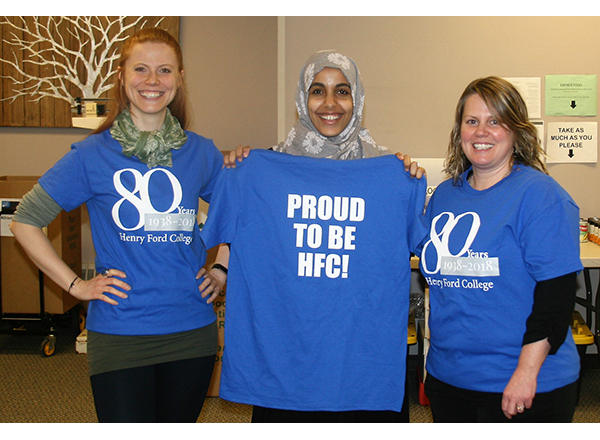 Photo: HFC students Lucy Smith (left) and Baraka Elmadari (center), with HFC Student Activities Associate Mandy Earl (right), proudly show off their HFC 80th anniversary T-shirts. As part of HFC's ongoing 80th anniversary celebration, an 80 Acts of Kindness Initative has been under way, to demonstrate our thanks to the communities the College serves for their support over the last eight decades. The initiative originated through the HFC Foundation Office to encourage HFC employees, students, alumni, and retirees to engage in volunteer opportunities that support the community in meaningful ways. If you plan to participate in a volunteer project on behalf of the College, or if you have already volunteered this past year, you are invited to pick up an 80th anniversary T-shirt from the Office of Student Activities (OSA), M-105 of the Student & Culinary Arts Center (Building M). If possible, wear your T-shirt while volunteering. Take photos and send them to Stacy Bazman at slbazman@hfcc.edu and to communications@hfcc.edu. One T-shirt per person, while supplies last. For questions or further information, contact the OSA at 313-845-9865 or contact Mandy Earl, mlearl1@hfcc.edu.